It’s no secret that Coloradans love their dogs. Doggie daycares, pet walking services and even boutiques catering to dogs are evidence that they are cherished members of our family. Even outside the home, we like to accommodate our furry friends with doggie friendly bars like The Watering Bowl and Biscuits and Brews. Whether you’re at a dog friendly brewery, dog park, or just walking down a street in the Denver area, remember the following tips when meeting a dog for the first time, or even the hundredth time since animals are unpredictable. You can change your behavior to avoid a dog bite. Given the risk vs. reward, we would advise you to fight the urge to pet every cute pup you see. But if you just can’t resist the pull to buddy up to man’s best friend, please heed the following advice. Play “hard to get” Let the dog be interested in your first. Begin speaking to the owner and if the dog appears to be friendly and interested, ask permission to meet the dog. Use a calm, low tone voice. They can’t necessarily understand what you’re saying, but they care HOW you’re saying it. Turn your body to the side; this is a non-threatening posture. Walk up to a dog, into their space, and put your hand in their face. Crouch over the dog, squat or stand straight. Pet the head or ears. Pet below the head. Force the interaction if they back away. Pull a toy away or grab their tail. Yell, kick or strike out. Throw your hands up in an aggressive stance. Remain calm. This shows the dog you are in charge. It also surprises it. Put an object in between you, even if it is just your clothing, something to create a barrier between the dog and your skin. Avoid being bit in the face, neck or chest – bites there cause the most damage. Pass along these tips to your children. Of the 4.5 million Americans bitten by dogs annually, half of all victims are children, according to the Centers for Disease Control and Prevention. The Frickey Law Firm has helped dog bite victims in the Denver Metro area for decades and is familiar with the steps to take to pursue a case against the dog’s owner. 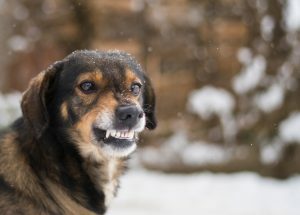 Colorado imposes what is known as “strict liability” when it comes to dog bites. Under strict liability, a dog’s owner is liable for injuries resulting from a dog attack, even if he or she had no knowledge of a dog’s potentially aggressive nature. If you are a dog owner, refer to our dog owner’s checklist in the infographic here. In addition to encountering more dogs in public, many Coloradans come face to face with dogs as part of their jobs. As the use of Amazon’s delivery services increase, so will the number of interactions between dogs guarding their homes and Colorado delivery drivers.